In the world of watches, ‘ABC’ has nothing to do with the alphabet – instead, it stands for altimeter, barometer, compass. Watches within the ABC category will include all three of those functions, along with the ability to tell time (of course). If you happen to engage in activities that call for some or all of those functions, then owning a good ABC watch can make your life much easier. Something you should know right off the bat – is you shouldn’t expect to make a fashion statement with an ABC watch. While some options are better looking than others, most of them are rather large due to the amount of physical space required to offer altimeter, barometer, and compass functions. It is difficult to fit all of the inner workings into a small package, so you can expect this watch to be somewhat bulky on your wrist. A high-quality ABC watch can provide you with valuable information about where you are and help you analyze the surrounding environment. An altimeter tracks your vertical movement, a barometer examines the trend in air pressure, and a compass will help point you in the right direction. One frustration with ABC watches is their inaccuracy, which can sometimes be a result of not setting it correctly or poor quality. So once you select a watch, set aside some time to learn how to use it properly so you can optimize its efficiency and effectiveness when you’re out in the field. If you don’t, then the device may prove itself useless during one of your treks. An ABC watch is that big, bulky device you keep seeing on everyone’s wrist lately. It gives Altimeter, Barometer and Compass readings, which is what the ABC stands for. This kind of watch is entirely electronic, which means it needs batteries to operate at all times. It’s not a very accurate device because it mostly relies on barometric readings. The altimeter can be somewhat accurate when it’s calibrated in the right way. Some models present moon and tide information. Some can predict weather changes. Specific models even have integrated sonar panels that eliminate the need for batteries. An ABC watch is usually big, bulky and easy to notice. Most models can take a beating since they are heavy duty, and you can even dive with them. For people who love and use them, these are irreplaceable. For the rest, they’re a tricky and unknown subject that seems hard to understand. Well, only people that don’t know these as well usually have a poor experience with them. ABC watches are versatile and handy devices that offer much significant information for experienced outdoorsmen. Because people mostly complain that these aren’t accurate, the mindset you approach them with is crucial. The point is not to rely on their accuracy, but rather to use them as reference and estimate. Once you have the right frame of mind, the watch becomes an irreplaceable piece of equipment you’ll always want to have at hand. The market is packed with different models that offer a wide variety of features. All of those models are quite similar, so your search shouldn’t be too hard. The key is to look into as many options as you can to be able to choose the one that fits you the best. This component measures Atmospheric Pressure or otherwise known as Barometric Pressure. There is a direct connection between the altitude and the air pressure of your location. The barometer measures this, which is what makes it as convenient. In simpler words; the air gets thinner due to lower air pressure as you go higher. These readings also tell you if there might be a storm on the horizon. Every time the pressure drops, you should start seeking shelter as a storm might happen soon. However, the pressure sometimes changes for different reasons that have nothing to do with altitude. Our planet has a twice-daily atmospheric pressure tire. The low-pressure and high-pressure zones directly impact the climate and weather. To simplify the entire story; we live under a lot of air, and all its weight puts particular pressure on us. The barometer in an ABC watch is what measures that pressure. Most watches have tilt compensation technology that allows accurate compass reading even when your wrist isn’t in a horizontal position. This kind of technology is always something to look for. Not all situations will allow you to keep your hand horizontal and steady, which is why the feature is useful. Overall, the feature itself is self-explanatory. The very first time you go hiking or mountain climbing, you’ll notice the difference this makes. If you think merely bringing a compass along will be sufficient, you’re wrong. There are manual compasses, too, but the digital ones are always a better choice. A digital compass tells direction regardless of in which direction you’re pointing. This is a simple feature that makes all the difference by determining your location and the way you’re heading. An altimeter is a feature that brings all the change to mountain climbers and hikers. Altimeters are actually used in planes, so having one in your watch has to be beneficial. These use atmospheric pressure to judge the altitude up or down in elevation. They measure the pressure of your location to calculate approximate height. Your ABC watch will probably come with some instructions so make sure to check those out. Setting the starting point is essential, which is why you shouldn’t take any chances. You can always set it up at sea level, and the altimeter will then measure changes in altitude as you hike. This component isn’t very accurate, but it’s still handy enough. For navigational purposes, use the compass on your watch to only give you an idea of where you are and where you’re headed. Don’t take it too seriously. Overall, it’s beneficial and useful in showing the four directions. Use the compass to find your position if you maybe get lost. Below we have compiled a list of five of the best ABC watch options on the market today. Before buying a new watch, think carefully about how you will use the watch. In addition to the altimeter, barometer, and compass functions, many ABC watches offer other features which you may or may not need. So carefully read through each review and make an informed purchase. The epitome of an ABC watch with the added feature of sunrise and sunset times for over 400 countries. This watch is a reliable companion you need for exploring the outdoors. 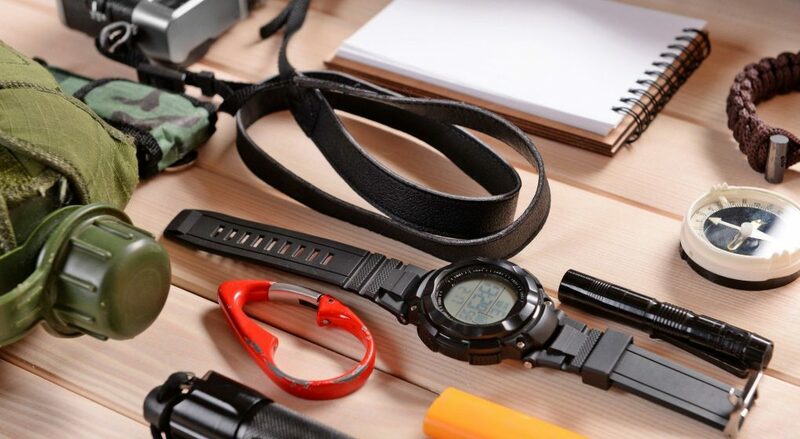 This Suunto watch will keep you prepared for any condition you’ll encounter in the great outdoors. For mountaineers, the altimeter will track your ascent and descent in elevation while on a climb. The barometer will gauge any change in air pressure, which lets you know if a storm is on the way so you can plan accordingly. The watch even has a storm alert function. Accompany those features with a compass and the ability to predict the sunrise and sunset, and you can avoid any variables that can delay or ruin an outdoor excursion. Also, the backlight makes this timepiece easy to read in the dark. Suunto is the leader in outdoor watches and only put out quality products. This ABC watch will not disappoint you. This Garmin ABC watch is another one of our favorites. The name in itself lets you know this watch is rugged and precise. This ABC combo watch is sleek and perfect for any office board meeting or wild excursion with its non-reflective black on black color scheme. Also, you have 2 stylish bands to pick from, silicone or nylon. Keep in mind that the nylon strap comes with a slightly higher price tag. The Tactix Bravo is built for accuracy. Everything from its Omni-directional EXO antenna to the GPS/GLONASS navigation system, this item is precise and will track your movements in the most challenging environments. The ABC feature automatically calibrates to ensure you’re receiving accurate information. For reliability, this device utilizes a 3-axis compass, so you know where you’re going at all times. This product from Garmin is tactical grade, which means it has been put to the test and guaranteed to perform in the roughest conditions. This watch operates with no delay and can update via wi-fi. It is compatible with night-vision goggles, too. This watch is a bit pricey, but we promise you won’t be disappointed. The solar-powered ABC watch is one of the best in the Casio family. It’s light in weight but very rugged for having such a large bezel. All viewing angles of the face are sharp and crisp. This product’s illumination feature is impressive, with the hour and minute markers lighting-up with the LED backlight. The Triple Sensor (ABC) functions operate with extreme accuracy, updating by the minute. It provides the temperature and with the press of a button, the hands of the watch move so you can clearly read the digital screen. Not only is the functionality top notch, but it is also extremely comfortable around the wrist, with a black silicone band (Dura Soft). This item from Casio is water-resistant and ideal for light swimming and snorkeling, but not equipped to handle diving. The Triple Sensor watch can provide the time in 29 other cities worldwide. This Pro Trek watch is definitely an ABC watch to consider. 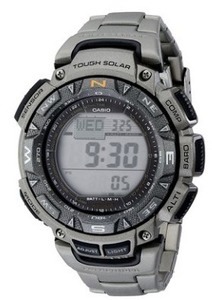 This tactical style multifunction watch is perfect for the outdoors. Also, there is no need to charge the battery. It is extremely energy efficient, but you will need to replace the battery once every year or so. This product offers more than the basic ABC functions, but features a thermometer, sunrise/sunset timer, world time, etc. Its ABC features are extremely accurate and professional grade. For example, this item features a Swiss altitude sensor. It is lightweight, robust, comfortable, and illuminates very well. It is constructed of stainless steel, and features PU material wrist strap. This item is perfect for all outdoor activities such as hiking, mountain climbing, and cycling. This ABC watch is another member of the Pro Trek family. It is solar-powered and utilizes multi-band atomic timekeeping, for accuracy. The version three Triple Sensor is the latest technology from Casio, so you know you’re getting your money’s worth. The green accents and carbon fiber wrist strap make this timepiece attractive and comfortable. 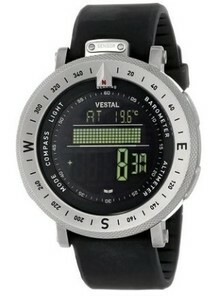 It offers both digital and analog modes and charts the data from the altimeter and barometer. The watch is very easy to operate and read, despite the initial looks. Also, it is perfect for all outdoor activities and the harshest conditions. The ability to tell world-time makes this watch perfect for traveling and excursions in other countries. It is waterproof and guaranteed to last. If you want an ABC watch that will deliver under any circumstances, then look no further than this Casio Pro Trek watch. The 6000Y watch is excellent for everyday use. It can be pricey, but it is worth every penny. Those who follow the watch market probably aren’t surprised to see a Casio model at the top of this list. Casio makes some of the best watches in the market for outdoor adventure, and that fact certainly holds true when it comes to the Pathfinder series. This is a watch with a moderate price tag, but it comes complete with as many features as you could imagine. Of course, it has the altimeter, barometer, and compass readings that are standard with watches in this article, but it also includes a backlight, countdown timer, world time for 48 cities, and more. One of the favorite features among reviewers is the lightweight titanium band which brings down the overall weight of the watch. Buyers are also happy with the look and size of the watch, stating that it is a large watch that has plenty of presence on your wrist. Also, it is solar powered, so batteries are not a concern. Overall, when looking for a solid ABC watch that will turn in a good performance day after day, it seems that the Casio Pathfinder is an excellent place to start your search. A good deal is hard to come by in the world of ABC watches, as the internal workings necessary to provide accurate readings means that these watches rarely sell for cheap. If you are looking to get the functionality of an ABC watch while keeping costs down, the Lad Weather model listed here is a strong choice. It has earned solid reviews and includes a variety of functions. You probably won’t feel that it offers the same high-end look as some of the more expensive options, but that is to be expected. As long as it is just information that you are after, this watch can do the trick. Many buyers feel that this watch is providing them with all of the information they would have gotten from a far-more-expensive watch for just a fraction of the price. The value is one of the points that is brought up over and over again. It is clear that this watch isn’t a ‘luxury’ item, but it doesn’t have a luxury price tag either. For what it is, the Lad Weather Watch has plenty of fans. It is no surprise to find a Suunto product on this list. They are one of the leaders in the ABC watch business, and there are a variety of models in their product line that have the capability of offering altimeter, barometer, and compass readings. The Suunto Traverse takes the whole game to another level. You’ll never get lost in the wild with its GPS and GLONASS (global satellite navigation system) for route and point of interest navigation. This product offers a real-time breadcrumb view of a recorded track, so you can always retrace your steps. It’s efficient at tracking speed, distance, and altitude. This timepiece is manufactured in Finland and features a round 50mm (diameter). It is enclosed in a composite case with a mineral crystal glass display and secured with silicone strap. The Suunto Traverse has a rechargeable lithium-ion battery that offers up to 100 hours of battery life. Also, it is water resistant up to 100m, displays sunset and sunrise times, and a storm alarm. Customers love its ability to route plan in the Suunto Movescount App with topographic maps. The possibilities are endless with this watch and the perfect fit if you’re an outdoor enthusiast. Vestal might not be a name that is as well-recognized as those of Casio or Suunto, but they produce watches that are capable of many of the same features. Of course, it has the altitude, barometer, and compass function that we are looking for in this article, and it is also water resistant and has a stainless steel case. As far as price goes, you will have to invest heavily in this one as well. Reviewers like the heavy-duty feel of this watch, and they compliment its durability and appearance. It is considered by many to be easy to use, and water doesn’t seem to affect its performance. While you might not have heard of the Vestal name, it would be wise to give this option some consideration. This last option on our list is a bit of a departure from the other models listed above. Garmin is better known as a GPS company than a watchmaker, and indeed, this is a GPS watch. However, it also has the ability to gather altitude, barometric pressure, and compass readings, meaning it can certainly qualify as an ABC watch. Most buyers have been impressed with the quality of this watch and the versatility that it brings to your arm. 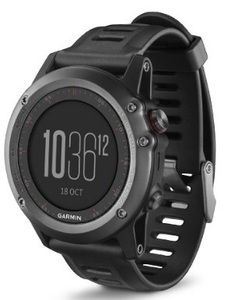 When an all-around watch is what you are after – and you would like one that offers ABC capability – the Garmin Fenix 3 is an amazing piece of technology. You’d have to do some significant research and reading to understand how an ABC watch works. Because of the relationship between current absolute pressure and sea level pressure, you must pay particular attention to how you set it up. It’s also crucial you recalibrate it frequently to ensure accurate readings. The altimeter uses a sensor to measure the current air pressure. The air pressure that’s measured then provides a value based on the altitude. Preset pressure is converted into altitude readings. As altitude increases, air pressure and temperatures also become lower. Measuring height on the lower air pressure then judges your altitude as accurately as possible. Although there are so many different models on the market, they all work similarly. Most have various features that distinguish them from one another, but the most basic elements of ABC watches all work the same. If this is your first time buying an ABC watch, we understand that the search can become somewhat overwhelming. With so many different brands and models on the market, choosing only one isn’t as easy as it seems. To be safe, it’s best you consider all factors, features, and specifications you have in mind. Think about what you’d need it for the most. Also, consider if its specs and features will deliver what you need. We’ve put together a little buyer’s guide to help you in your search. Below you’ll find all the factors to consider when shopping for an ABC watch. Continue reading to learn what to look for in the best ABC watch for you. There probably isn’t any question that’s more important than this one. Knowing how you’ll be using your ABC watch helps you to find the best one for you. There are many on the market, so it’s important to know their use and whether they’d be useful to you. If you plan to run a marathon, you probably have different needs than someone who’s just going to hike from time to time. For example, rock climbers need a lightweight and durable watch, while professional runners need a model that’s also waterproof and features a heart rate monitor. Ask yourself this simple question as it’s going to help you determine what the best watch for your needs is. Do you need a lightweight one? How important is the design for you? Does it have to be waterproof? All of these will help you decide what you’re looking for. You’ll have to pay special attention to this regardless of the model you’ve set your eyes on. All models are different and in most cases, they have different accuracy, too. Once you’ve decided on a particular model, it’s best that you do some research on it. Check out customer reviews to see how people feel about its accuracy and overall performance. We suggest you always go for trustworthy and well-known brands. In most cases, these take accuracy seriously. Digital compass works via magnetic sensor technology, but they are just as accurate as non-digital ones. Higher the technology, the more precise compass reading. Similar to all other readings, manufacturers usually pay attention to the matter. Some of the best brands put time and effort to ensure that the compass is accurate providing only the best information. Unfortunately, there isn’t any way in which you can tell whether the watch is accurate or not. This is something you won’t be able to tell until you’ve used it for some time. However, as we said, it’s recommended you opt for trust-worthy brands that have many pleased customers. Whenever there’s a battery-operated device, it’s normal you ask questions about battery life. When it comes to an ABC timepiece, you want a reliable battery that won’t give up on you in the middle of your outdoor adventures. Some models have specific features that drain the battery rather quickly. If it has a GPS, its battery life is probably shorter by at least 8 hours. If you’re hiking occasionally or on weekends, this probably won’t be such a problem to you. However, you’d miss the extra 8 hours if you’re a professional who’d use the timepiece more often. It’s recommended that you always consider battery life when you’re choosing the watch for you. It’s essential that it meets your needs, so you have to know what’s the battery in question. Once you pick out a model you like, make sure to know how it’s powered. Always check on how long the battery would last especially with all its features on full use. If it has a GPS feature, its battery life is probably the most critical factor to consider. Is It an Everyday Watch? One of the most frequently asked questions is if the watch is stylish enough to be worn every day. In most cases, the answer is yes. Still, it depends on where you work and whether the watch matches your overall style. If you work in a suit and tie, an ABC timepiece wouldn’t probably work as good as it would if you’re into a more business casual work environment. The main thing to look for is its size. This factor is usually the primary thing that decides on how ordinary and every day does the model look. Most ABC watches are bulky and big. This is a problem if you want to fit it under it under your sleeve. The size makes it look weird even if it does fit under the cuff. Luckily, some brands are considerate and try to make stylish models that can be worn in everyday situations. When you’re looking for your next ABC timepiece, consider its features, but pay some attention to the size, too. Though bulky models are far more popular, some more subtle watches are just as impressive. Is the size what decides on how wearable it is in everyday situations? In most cases, yes. If it’s too big, it’s just too uncomfortable and inconvenient to carry around each day. Many people often ask if GPS is a must when it comes to choosing the right ABC. However, nobody but you can answer this. Same as with other features, ask yourself will you need GPS on your wrist. However, GPS makes all the difference, especially when it comes to pricing. The last thing you want is to decide you don’t need GPS after you’ve already invested in a particular model. This is a feature that most people will say you don’t need. However, if you ask someone who used it before, it’s certain that they’ll recommend you try it too. Once you go out with GPS on your wrist, you’ll feel the change. GPS is certainly not necessary to have, so you can freely decide whether you want to invest in this or not. If you’re into mountain climbing and camping, you’ll probably find GPS reliable and useful. If you’re only hiking from time to time, it’s highly likely that this feature won’t play such a prominent role in your experience. Most models are quite durable since they’re made for severe outdoors use. However, it all depends on the brand and quality they’ve put in the manufacturing process. Some high-quality ones are drop resistant and waterproof, so they are far more durable than others. If you’re a professional who will use it often, it’s recommended you opt for a more sustainable model just in case. If not, a simpler one will also do. It’s also important to pay attention to the strap that comes with the watch. For outdoor pursuits, it’s best you choose a rubber band that’s a bit more flexible and comfortable. For best durability, consider metal straps. Though a metal strap won’t be a good choice for certain people, it’s by far the most durable option. Leather is also an option if you’re a fan. It’s always best to check customer reviews and ratings to find out about durability. These are the people that can tell you about how tough the watch is. This is another feature that makes all the difference to some, while it’s unnecessary to others. It’s a matter of your preference, so you’re the one that has to decide whether you need it or not. ABC models are usually water resistant while some are waterproof. The difference is small but significant. Which one of the two is more beneficial? It depends on what you’re planning to do with the device. Because this is a somewhat common feature, it doesn’t impact the overall pricing. Most quality ones come with plenty of useful stuff, water resistance being just one of them. If you’re camping and fishing, you might want to consider a timepiece that’s resistant to water. You might never need it, but it’s far better to be safe than sorry. It’s also important to choose only the products that have rubber straps. These are the best to handle often water exposure. Leather and metal bands will break quite easily if wet. It’s recommended you opt for the one that can withstand being sunk to at least 30m. However, there are models you can sink under 50m and 100m of water, too. Another critical factor is the ease of use. Whether a watch is easy to use or not is determined by many different things. Imagine having a high-quality timepiece that can measure all kinds of data and has all the best features, but it’s difficult to use. It might offer many great things but do you really want to go through several menus at a time? Simplicity is the key whether the watch has three or thirty features. All its characteristics have to be simple to use, or you’ll find yourself not using them at all. The interface has to be intuitive to be accessible an easy. You want the one that has two or three buttons and offers all the info with just a few button presses. Many models look stylish and modern claiming to have many features. The important question to ask is how accessible those features are. You may think this is neglectable, but when you’re out in the open and needing quick info, you’ll probably appreciate a simple and accessible ABC watch. Nowadays, it’s essential for us to that our gadgets are connected to one another. There are many things we connect to our Smartphone, so why would an ABC watch be an exception. There are benefits to this, which is why it’s as important to people. Still, you may think it’s cool and handy, but keep battery life on your mind. Wiring your phone to your watch will drain both batteries much quicker than you think. Most have Wi-Fi and Bluetooth connections that allow you to download the data that the watch collects. Do you absolutely need Smartphone capability? Probably not, but you’re the one that knows this the best. Think about your preferences and needs to figure out if you’d need to connect your phone to the watch. ABC watches come in different types that offer a wide variety of features. This choice allows you to pick between many models to find that one that suits you the best. As you research more and more, you’ll notice that the choice narrows. We recommend you consider one of the three most popular types that are diving, Luminox, and G-shock Frogman models. What makes them the best? Continue reading to learn some basic info about these types of ABC watches. A diving watch is a must for so many adventurers out there. It has all the benefits and features as all ABC watches, plus some depth gauge that most models lack. This is where it gets tricky. Because a very few models have a depth gauge, if you’re a scuba diver, your options are limited. The main thing you have to consider is how deep can it go. Some models go as deep as 30 feet, while a few models can even go up to 100 feet underwater. We’ve done some research on these and based on customer reviews; we can say they perform well. However, it’s highly recommended you double check these specifications just in case. When Casio G-shock line came out, it had the Frogman model as its most high-end product. 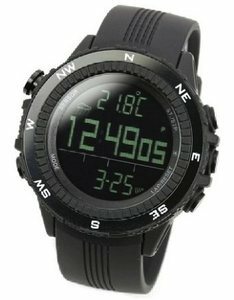 If you know anything about Casio, you probably remember their Master of G line, with Frogman as one of the first models. It’s a special-use model with an asymmetric shape. It’s considered a diving watch suitable for scuba divers. This is the only G-Shock line that’s ISO 6425 compliant with a 200 m divers rating. It’s a good choice, and you should definitely consider it if you’re on a hunt for a high-quality ABC watch. This company has been around for over 25 years, and it’s one of the most trustworthy brands there is. This high-performance timepiece is stylish, reliable and durable. Luminox provides the durability demanded by US armed forces using innovative technology and Swiss precision. Since 1999, they are also making diving watches for U.S. Navy SEAL teams. You can only imagine the rigorous demands of the Navy; Luminox has met them all. It has the prestigious A.N.U. title which means it’s Authorized for Naval Use. After this, the Air Force has requested some, too, especially for F-117 Nighthawk Stealth pilots. Ever since then, these are the watches used by land, sea and air forces. If you want an all-round ABC watch that’s high quality and packed with features, this is a good option to consider. Suunto has some of the best models on the market, so it’s no surprise that one of them is on our list. This one has an altimeter, barometer, and a compass. A barometer tells info about air pressure, an altimeter tracks your vertical movement while a compass leads the way. It tracks the sun and weather for you, which is highly useful if you’re staying outdoors for days when camping, for example. It has a Trend graph and a storm alarm. These help you stay safe along with the preset sunrise/sunset times for more than 400 locations. It’s a wrist-top computer watch with features such as dual time, alarm, date, countdown timer, sports chronograph, etc. Its altimeter shows current elevation, ascent or descent speed and records all the progress. It comes with a 2-year warranty and is definitely a model worth your attention. Once you narrow down your search to ABC watches, you pretty much know what you are going to be getting in terms of functionality (unless you pick an all-around watch like the Garmin). Therefore, the buying decision is going to come down mostly to quality, price, and appearance. Sort through the options that we have presented you with above until you are able to pick one that checks off all of the boxes on your list.